The icon of the Mother of God of Mount Carmel was ‘written’ by the Carmelite Sisters of the Monastery Cerreto in Italy (Fig. 1). The Mother of God is flanked by a quartet of important figures from the history of the Carmelite Order, which received ecclesiastical approval around 1207. The Carmelite monks lived as hermits in a valley near the ‘Spring of Elijah’ on Mount Carmel. Despite their hermitic existence, the monks came together to pray and worship. Under the leadership of their prior, Brother B., they structured a plan for a lifestyle that reflected their values and they sought consent from the church authorities. St Albert, Patriarch of Jerusalem, conferred his approval in the form of a Formula Vitae. This Holy Rule of the Carmelite Order served as the primary governing guide for the monks then and to date Carmelite family throughout the world. The legislative text is composed of a mere 20 short chapters for Carmelite monastic communities everywhere; the monks and later, the nuns who have taken vows. The 16th century witnessed an important reform movement with central roles played by two major Spanish figures; the Carmelite nun, Teresa of Avila and the monk, Juan de la Cruz (St John of the Cross). This development took the form of a restoration and revitalization of the original precepts and values of the community. In the late 13th century, with the Saracens in control of the Holy Land, the monks were forced to leave Mount Carmel and many settled in Europe, mainly Spain. In 1245, Pope Innocent IV’s formal decree gave them a place in the community of Mendicant Orders; a term referring to those accepting the rule of absolute poverty and austerity. The reform of Teresa created an order referred to as the ‘Discalced Carmelites’ or ‘Teresians’. This second order was independent from the ‘Calced’ or The Carmelite Order of the Ancient Observance who, despite the division, survived as a community. A famous Carmelite monk in the Netherlands, the Blessed Titus Brandsma, was beatified in 1985 by Pope John Paul II, now also given sainthood. Brandsma was a professor of philosophy, mysticism and the religious history of the Netherlands as well as co-founder of the Catholic University of Nijmegen (now Radboud University). During the Second World War, he played an important role in defending freedom of speech and the press against Nazi oppression and ideological propaganda. Brandsma organized national support for the Catholic press which had come under scrutiny and attack from National Socialism. His resistance and steadfastness against Nazism led to his arrest in 1942. Shifted to various concentration camps, in July of that year he was transferred to Dachau where, after receiving a lethal injection, he died. Titus Brandsma appears as one of the four main figures, bottom right, on the icon of the Mother of God of Mount Carmel. Above him stands St Albert, Patriarch of Jerusalem who presented the Carmelites with the Formula Vitae. In 2014, the 800-year anniversary of his death was celebrated. St Teresa of Avila appears on the upper right corner of the icon. In 1970, Pope Paul VI bestowed on her, together with St Catherine of Sienna, the title Doctor of the Church, the first women to receive this honor. This year the church will celebrate the 500thanniversary of St Teresa’s birth. Under her stands St Mary Magdalene de Pazzi, renowned as an important Carmelite mystic living in Italy in the 16th century. Her 450 birthday will be observed in 2016. These four figures from the history of the Carmelites are presented as a kind of transfiguration or substantiation of their attributes; a play on the following words, which are etymologically related and are characteristic of the saints: ‘holy’, ‘healing’, ‘whole’ and ‘wholesome’. They are depicted, symmetrically framing the four corners of the icon, in the full light of God’s glory, the radiant Sun of Righteousness. 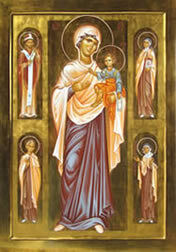 The Mother of God of Mount Carmel with the Christ Child in her arms, reigns in all her splendor central in the icon. Every Carmelite icon of the Blessed Virgin recalls the divine relationship between Mother and Son and evokes the special relationship the order has with the Virgin Mary. Since the 4th century, the moniker Theotokos (Θεοτοκος), the Greek term which carries the meaning of “God-bearer” or “Birth-giver to God”, has symbolized this important theological concept. This title refers to her place in religious and spiritual iconography as the Mother of God and a mother of ‘evangelism’, intimately touching the hearts of mankind with the eternal beauty of her heart, body and soul; a jewel emanating light on the world (1 Peter 3:4). The three crosses of light, two of which are visible on the icon, symbolize this special ‘trinity’ of the Blessed Virgin Mary. Like a cloud of God’s glory, the halo which enfolds her, illustrates her totality and sanctity. The Mother of God is dressed in imperial garments with light radiating outwards from her white cloak. The icon remains faithful to the Carmelite colors of brown and white, with shades of purple and blue in her tunic. The latter colors bear reference to traditional canons for depicting Mary, for example, as in the clothing of the Hodegetria (Our Lady of the Way). The Child Jesus is presented in an upright, regal position, bestowing blessing from the Virgin’s left arm. He is turned, ever so slightly, towards her. He is the ultimate source of divinity and light; the evangelist, bearer of the ‘Good News’. 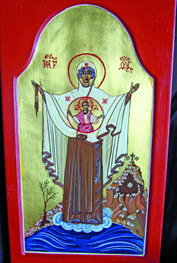 An icon, The Mother of God of Mount Carmel, from the Netherlands, shows a variation on the theme (Fig. 2 Cees Bartels, 2007 (ed). The Blessed Virgin is depicted as the Mother of God of the Sign with the Child Jesus encircled in a mandorla or medallion signifying his glory; the Virgin’s pose is the Orante or Praying Madonna. The holy Mount Carmel can be seen in the background of the icon. Prayer and contemplation are the spiritual focus of the Carmelite community worldwide. The daily life of the Carmelites revolves around the three basic elements of their spiritual focus. The exercise of communal prayer linking them to God; continual meditation and contemplation as a path to spirituality through reading the Scriptures; the community’s focal point revolves around the Scriptures, the Word of God. The participants take turns reading texts from the Bible and sharing their spiritual experiences. The core of the lives of the Carmelites is community and service, as brothers and sisters. Through prayer and contemplation, the order serves God, each other and the community it reaches out to help. Carmelite orders are found throughout the world, not only as cloistered religious communities but also large groups of laymen and women share in their liturgical precepts and practical principles. Together they form the Carmelite Family. The feast of Our Lady of Mount Carmel, as the festival is called, takes places annually on 16 July.